By Jennifer Tiritilli Ranu, Foreword by Congressman Bill Pascrell Jr. In the early 1900s, the Little Italy, Riverside, Stony Road, and Sandy Hill sections of Paterson, all within walking distance of booming factories and mills, became neighborhoods that offered Italian immigrants the opportunity to be near employment and to have a better life for themselves and their families. 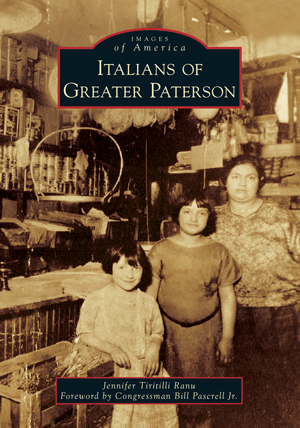 Paterson's Italians always helped each other during tough times and contributed to making Paterson a great city and a great place to live. Cooking Italian recipes for fun holidays; gardening in the backyard; and honoring heroes of the military, politics, sports, and the arts are valuable traditions and customs passed down through generations. The works of Gaetano Federici, a sculptor from Paterson, reflect the city's history, especially in front of Paterson City Hall and at St. Michael the Archangel Church. Floyd Vivino entertains audiences and almost always mentions Paterson in his shows, while actor Lou Costello proudly reminded his audience at the end of almost every show that he was from Paterson. De Franco's Lock and Safe, Peragallo's Organ Company, and Ordini Pools are just a few family-owned Italian businesses that began many decades ago and are still in operation today. Jennifer Tiritilli Ranu, of Italian heritage, was born and raised in Paterson, New Jersey. She served as an educator in Paterson’s schools and as a professor at Montclair State University. Ranu is a VIP at the Paterson Great Falls National Historical Park. She is the author of SkateKey.